Built by Blohm & Voss Shipbuilders, Hamburg, Germany, 1922. 56,551 gross tons; 950 (bp) feet long; 100 feet wide. Steam turbine engines, triple screw. Service speed 23.5 knots. 2,145 passengers (750 first class, 545 second class, 850 third class). Built for Hamburg-American Line, German flag, in 1914 and named Bismarck. Laid up, 1914-19. Work contiuned in Britain until 1919. 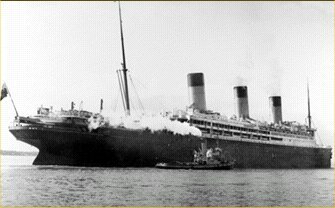 Sold to White Star and Dominion Lines, in 1921 and renamed Majestic. Southampton-New York service. Transferred to British Admiralty, British flag, in 1936 and renamed HMS Caledonia. Refitted as cadets’ training ship service. Burned and sank while berthed at Rosyth, Scotland on September 29, 1939. Scrapped in 1943.